Did you freak out when you read that. Survey parents?! Say Whhhaattt?! I know. I get it. I felt the same way. I really did. Until I did it and it was a great experience. It was not a surprise to me that I am my own worst critic and the feedback I got from parents really was helpful. So...why do it? 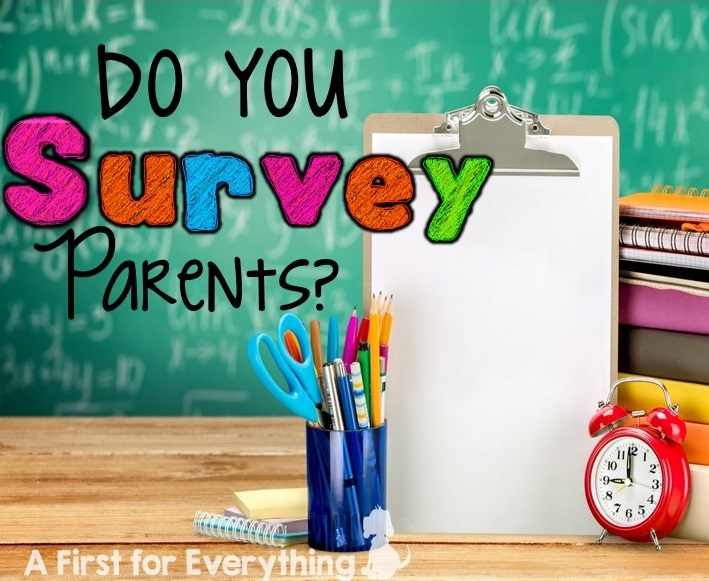 Surveying parents can help give you as the teacher, the perspective on what it is like to be a parent in your classroom. Are you giving too much homework? Too little? Do you communicate enough? And so on. It really helped me to be the best teacher I can be and I'm glad I did it. So much so, that I plan on surveying parents every year. You can use a survey at the beginning of the year to get a feel for what parents hope their child's experience in your classroom is like, mid-year as a way to see how things are going, or at the end of the year as a way to reflect on how the year went and if there's some things you want to do differently next year. Here's a tutorial on how to generate an anonymous survey using google docs. 1. Begin by opening Google Drive. 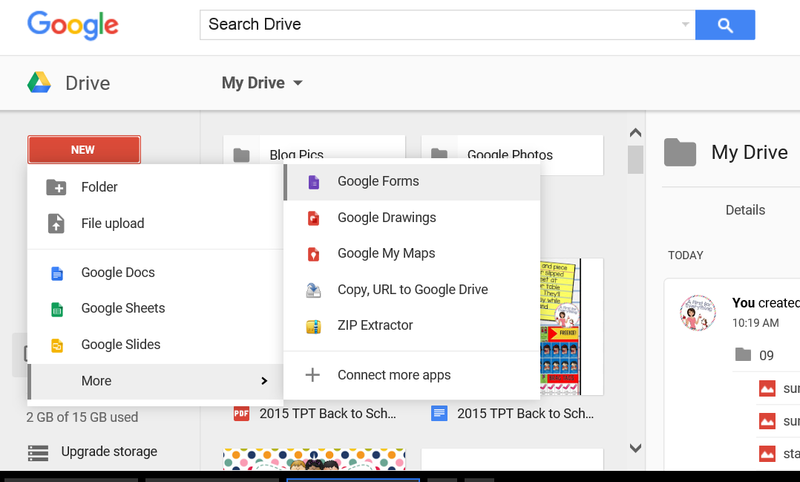 Click new, then more, then google forms. 3. I haven't changed anything in the form settings at the top. I went to the Untitled Form. I typed in a new title here (where it says Untitled Form). Think about what you want to call the survey. I called mine First Grade Survey. 4. Type in the first question you want to ask where it says: Question Title (you can make the survey as long or as brief as you like). I left help text blank but if you wanted you could add something there like: choose the best answer, or select one answer, etc. 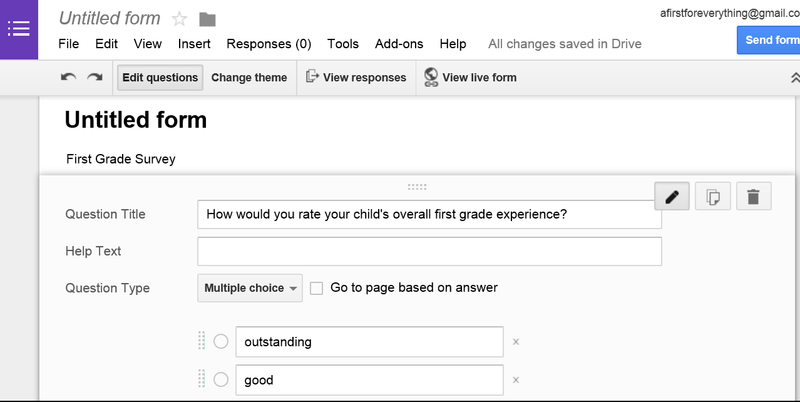 Under question type you can click to get many options such as paragraph, scale, grid, etc. I kept it simple and choice multiple choice. I then typed in my choice for response. You add as many or as little as your like. When done, click done. You can add more questions by clicking add item. I did not want parents to be able to see the responses of others so I did not check off "Publish and show a public link to others" and I did not want people to be able to change their responses so I also did not check "Allow responders to edit responses after submitting. 6. Click send form. You will now find a form where you can enter email addresses. Enter in your parents' emails. It will then ask you what you want to name your response from. This is where the results of the survey will be. I just call my "Survey Responses". Click send and your are done. 7. Now parents will get an email with a link to complete the form you created. You can assure them that responses remain anonymous. 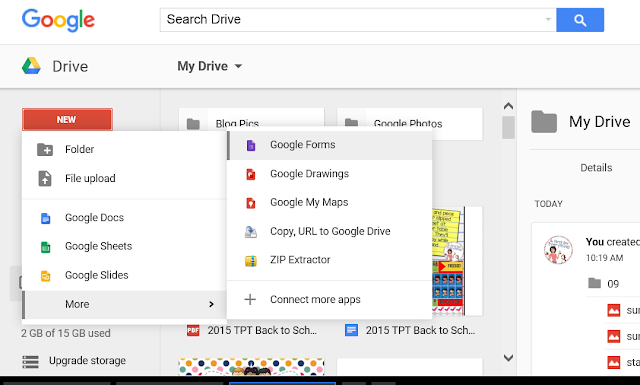 You can go into google drive and you will see the name of the response for that you created. This is what the response form will look like. You can see that the parent remains anonymous because all you can see is a timestamp. If you want you can click on share, to share the form. Since I plan on making increasing parent communication a professional goal this year for my state evaluation system, I will click share and share the from with my evaluator. That's it. It's all pretty easy and pretty painless.